I call it a simple recipe because you will not find a recipe list shorter than this one. But again, there are also simple variations within the recipe that makes it multifaceted! Check out the subtle changes in the recipe and the way you can prepare the batter for wonderful results. I remember as a kid, my mother would make this dosa on a fairly regular basis. Regardless of how often she makes this dosa, I never grew tired of the taste and still like it just as much. Perhaps because of its tender texture or because it does not need any fermentation. 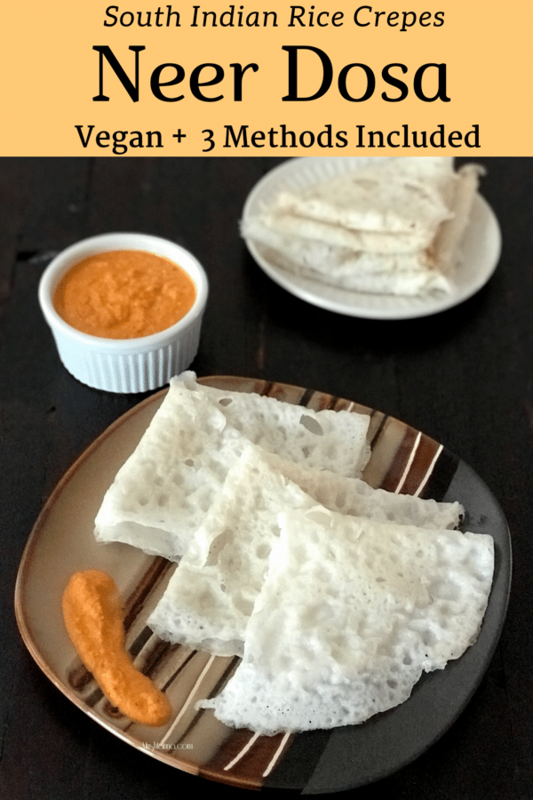 It is a thin, soft and gluten-free dosa! After doing a little bit of research on the internet, I noticed although several people share this recipe, none point out the variations or show any tips for serving or selecting the right kind of rice. So let us look at that nowâ€¦. 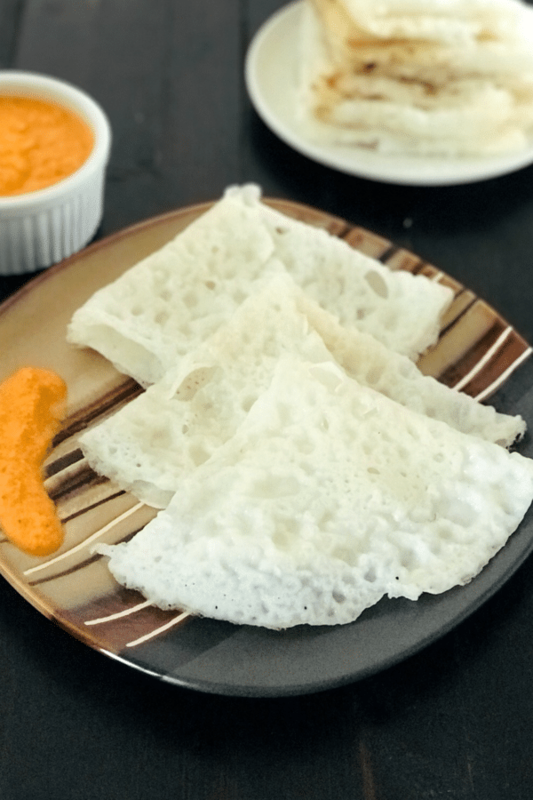 Plain Rice Neer Dosa: Unlike other South Indian dosa recipes, this neer dosa does not require any lentils, and needs only three main ingredients: rice, water, and salt. This is the version I have shared in this recipe and in my video. Rice & Coconut Neer Dosa: The version is also common for this dosa. As you can tell from the title, coconut is one of the key ingredients in this version. Coconut brings a tropical flavor to the dosa. Here I have given a sample of hebbar kitchen recipe. Neeru dosa goes very well with chutney, sambar, daal curry or Rasayana. If you are not familiar with what Rasayana is, I suggest you look for that recipe here. Neer dosa and Mango Rasayana combo are one of the local favorites in Udupi, India. I use long grain white rice (mahatma brand), sona masoori, or idli rice. Any type of white rice is good to use for this dosa. The kinds to avoid for this recipe are Basmati and Jasmine rice. For best results, always use a cast iron skillet. 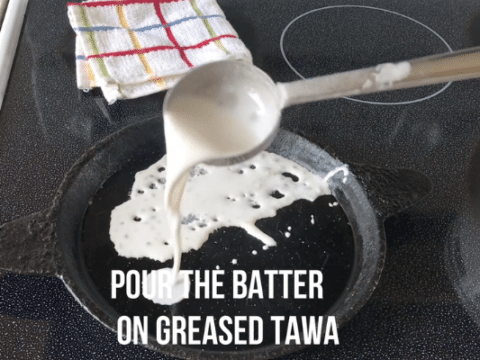 Heat the skillet or pan very well before you pour the batter. A little bit of oil spread out as a thin film makes the dosa come off easily. I use sesame oil, but any kind of cooking oil is good. Thin batter tends to produce better results for Neer Dosa. Always cook on one side only. Do not flip the dosa. Do not stack hot dosas as they tend to stick to one another. 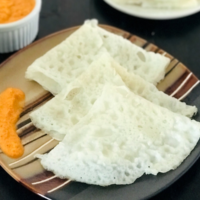 Storage Ideas to extend the shelf life of Neer Dosa Batter: As long as you keep the batter in an airtight vessel, the batter can last up to a week in the refrigerator. Once cooked, the dosas are best served hot. This dosa is one of the simple mangalorean dosa variety. If this recipe interests you, you will also like the following recipes from Simple Sumptuous Cooking. For more delicious vegan recipes in the future such as this sent directly to your inbox, just subscribe to my newsletter. You will also get a copy of my e-book where I have put together some simple vegan dessert recipes and dessert essentials. My readers have found it very helpful and I am hoping you will too! Add raw rice in a bowl. Soak the rice for 4-6 hours or overnight. 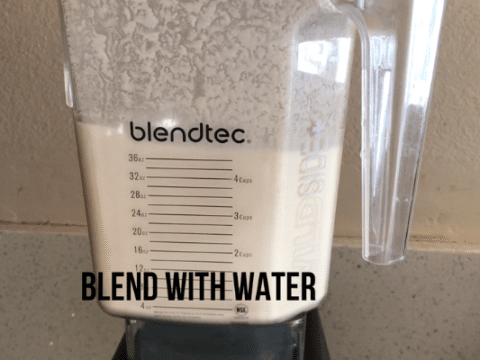 Wash the soaked rice and blend it in a smooth paste with water. I have included a short video clip to show how it looks. 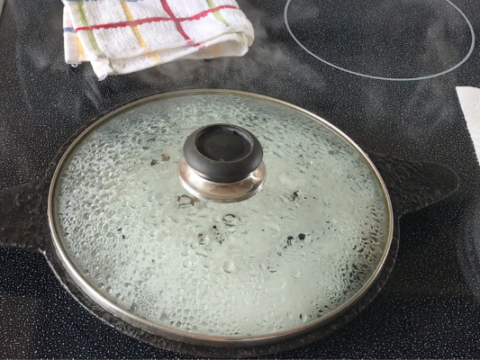 Place a cast iron skillet over medium heat and grease the surface with oil. 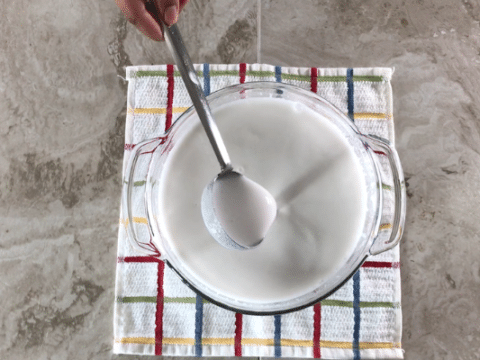 When it’s hot, hold the batter about 2 inches away from skillet and pour the batter as I show in the video clip. The dosa must be thin. So pour it very lightly with no layers. Cover the lid for few seconds and when it appears pale white, it is cooked. Remove the dosa from the skillet. 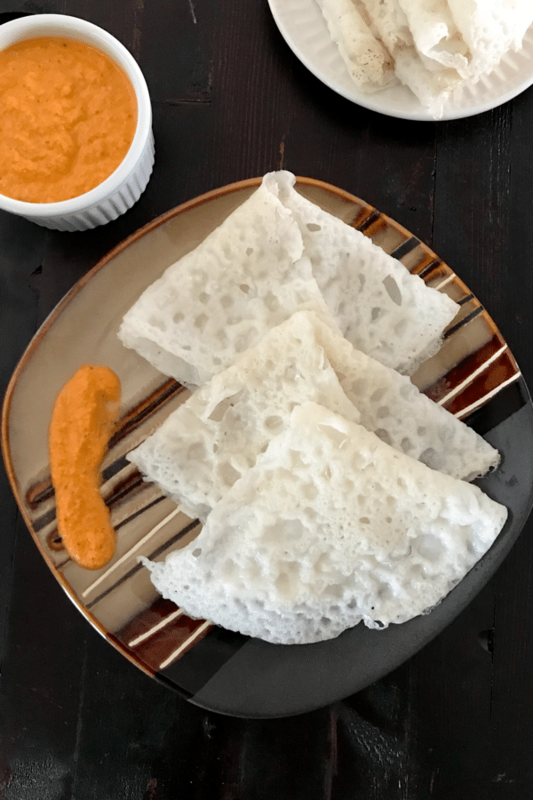 Unlike other South Indian dosa recipes, this neer dosa does not require any lentils and needs only three main ingredients: rice, water, and salt. This is the version I have shared in this recipe and in my video. 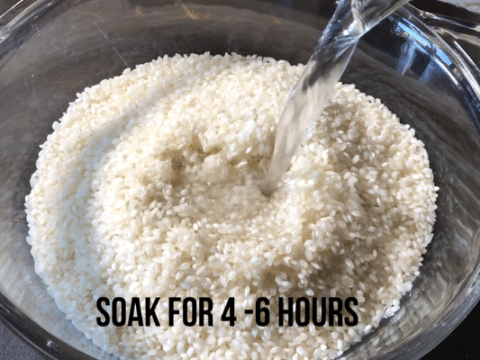 Soak the rice for 4-6 hours or overnight. 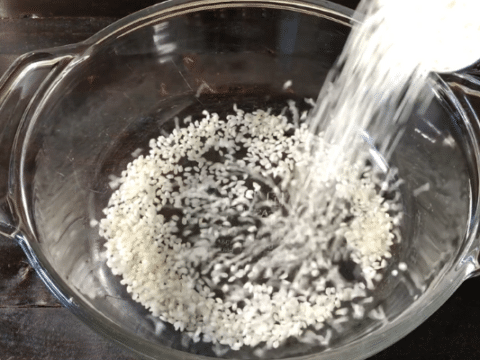 Wash the soaked rice and blend it in a smooth paste with water. I have included a short video clip to show how it looks. 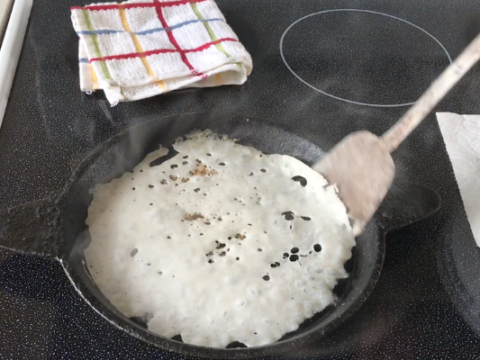 When it’s hot, hold the batter about 2 inches away from skillet and pour the batter as I show in the video clip. The dose must be thin. So pour it very lightly with no layers. Cover the lid for few seconds and when it appears pale white, it is cooked. Remove the dosa from the skillet. If you think your dosa batter is very thin, add a little rice flour to the batter and mix well. Neer Dosa is ready! Serve it hot with a side of coconut chutney!